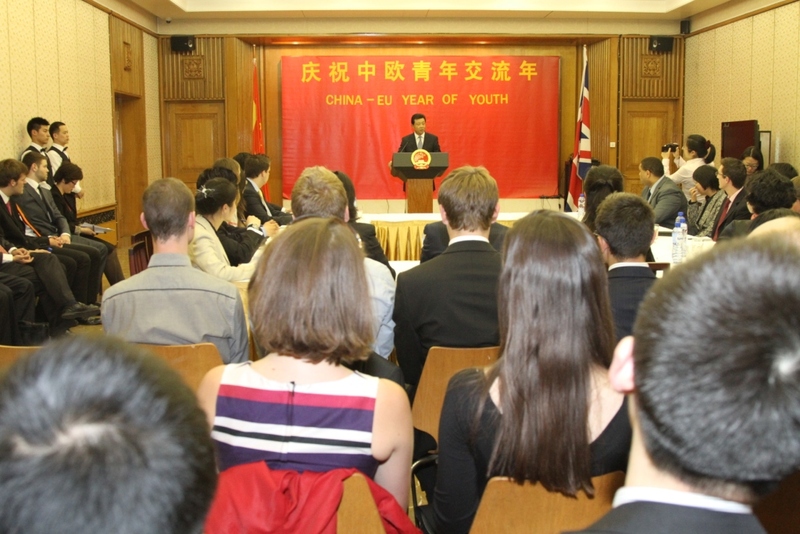 A very warm welcome to all of you to the Chinese Embassy for the celebration of the China-EU Year of Youth. Spring has come to London. In Britain the season of May is associated with beautiful flowers. In a couple of days, the full splendour of the blossoms will be on show in Chelsea. For the Chinese, May is a season associated with youth, as the Chinese Youth Day falls on May 4th. So a very happy Youth Day to you all! We in China also like to compare young people to flowers, as they are full of vigor and new ideas. They represent the vanguard of the times and the hope of the world. Just as Benjamin Disraeli observed, “Almost everything that is great has been done by youth. 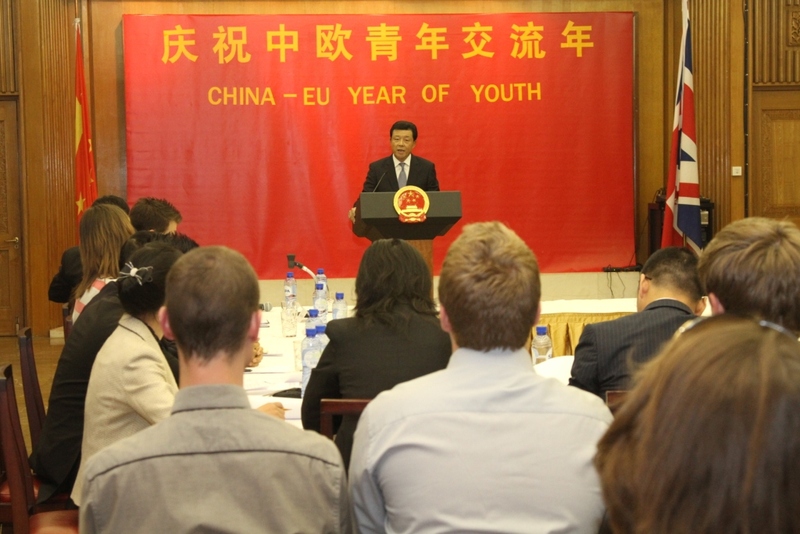 The China-EU Year of Youth is the first such event jointly hosted by China and the EU since the two established diplomatic relations. It is also by far the largest cultural exchange between the people of China and the EU. There are huge benefits to be gained by engaging our young people in face-to-face dialogue and close communication. A major gain is to greatly boost understanding between our different cultures. 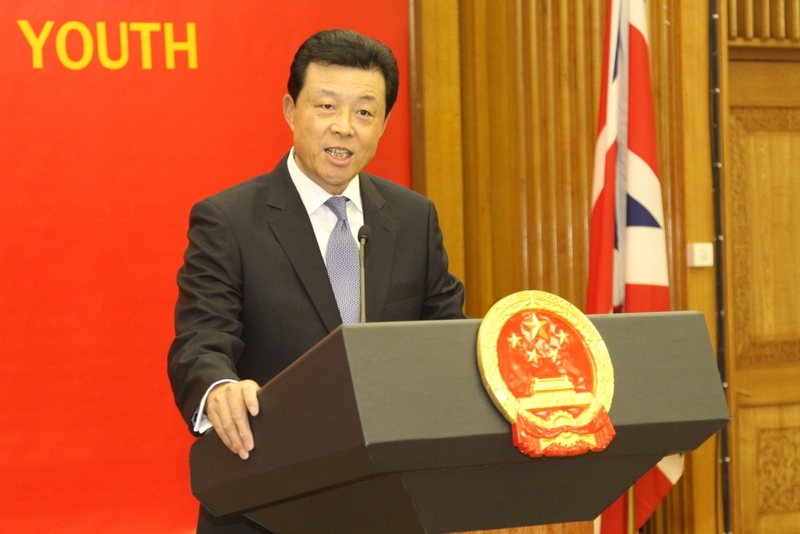 Through these exchanges we can deepen ties between China, the UK and the rest of Europe. I would like to share with you some of my thoughts on your topic today – how should we look at China’s development and its relations with Europe and the world? The changes in China for the past decades have been unprecedented in human history for any one country. So little wonder that such great and rapid changes have aroused worldwide interest. 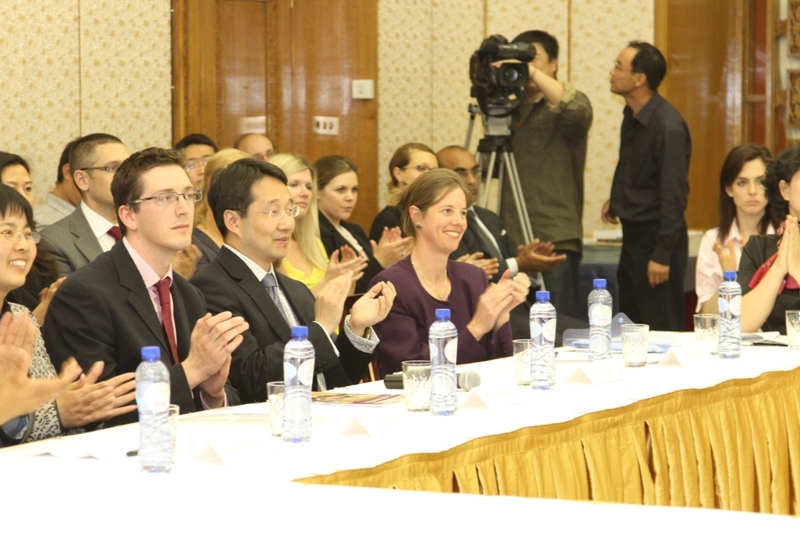 I hope you young people will be motivated to study China – and indeed many cultures, countries and civilisations. This study is crucial in a globalized world that we all live within. It is also vital that this study fosters respect for different cultures. There is a natural human response that everyone in the world should be the same as us with the same values. Travel in the world shows there is vast variety in cultures. Respect for these differences is a critical condition if we are to achieve the goal of sustainable and peaceful development of the world. First, one needs to see China in the light of its development. This includes China’s past and future. One hundred years ago, the Revolution of 1911 ended Imperial rule in China, and 10 years later, the Communist Party of China was founded. Before 1911 - and during the late 19th century and the early 20th century - China was a poor, weak and unstable country. History books have shown China was subject to constant foreign invasion and bullying. Many Chinese visionaries despaired about conditions in China and tried to save the country from this humiliation. All attempts at reform failed until the Communist Party of China led the Chinese people to independence and national liberation in 1949. Over the past three decades the Party has led China to a policy of reform and opening-up. And this has fundamentally changed China. When you are familiar with this part of the Chinese history, you will be able to understand why the history is on the side of the Communist Party and why the Party is supported by the people of China. China’s development is in the present continuous tense, not the present perfect tense. It has been only 60 years since the People’s Republic was founded, and just a little more than 30 years since reform and opening-up. Mr Deng Xiaoping came up with a quote that has become very popular to describe China’s progress. He said the way forward is "to manage to cross the river by feeling for the stones". China has indeed been “crossing the river by feeling for the stones” and in that way has overcome many difficulties. There have been twists and turns, but we managed to find a development path suited to the Chinese reality, that is what we call socialism with Chinese characteristics. Moving forward, we expect to encounter more challenges, some predictable, some not, but we are ready to take up the challenges and to seize the many opportunities. We are optimistic about the future of China. l Promote social justice and equity. This is a blueprint trusted and supported by the people of China. A recent Reuters/Ipsos poll shows that 78% of the Chinese people are confident about their country’s future, a figure higher than any other country in the world. Let me turn to the second point about observing China: one needs to see China in all aspects. This means first and foremost recognising China’s all-round development in the economic, political, social and cultural fields. It is sad that some people in the West fail to see this point. They tend to criticize China for focusing solely on economic growth while neglecting social progress. They say China is only carrying out economic reform, not political reform. This is a complete misreading of China’s comprehensive reform and development. Political reform has come with economic reform every step of the way in the past 3 decades. We have seen the growing role of the National People’s Congress and multi-party political consultation under the leadership of the Communist Party. Democratic decision making and the legal system have been strengthened, with over 200 laws formulated and the millennium-old pattern of ‘rule by man’ giving way to the ‘rule of law’. Life-long tenures of leadership position had long been a thing of the past and competitive appointments with public consultation are becoming the norm. Respect for and promotion of human rights has been written into the Chinese Constitution. This makes sure that the people enjoy unprecedented rights and freedoms. China has put into place a social security system that covers urban and rural residents. This aims to make sure Chinese people will be happier as they get richer. China has been able to make tremendous economic achievements only because of these reforms: such as strengthening legal system; improving human rights; creating an open and inclusive society and vastly improving living standards. But it is very important to grasp that China is still a developing country – despite its huge success. It is true that China now ranks as the second largest economy in the world. China’s GDP now accounts for 9.5% of the world total. But it is equally true that China still lags behind developed countries in many ways. This is due to a lack of balance, coordination and sustainability in China’s development. China’s GDP stood at 4,300 US dollars per head in 2010. That is one tenth that of the UK and behind about 100 countries in the world. 150 million Chinese people still live under the one-dollar-a-day UN poverty line. Though a major manufacturer, China does not have a single brand name on the world’s top 100 list. China’s energy intensity is three to four times the average level of developed countries and 8 times that of the UK. China cannot develop on its own. Its peaceful development calls for a peaceful international environment. China’s scientific development can only be achieved through win-win cooperation with other countries. A harmonious Chinese society would only be possible if China draws upon the useful experience and lessons of others. For those of you who study Chinese history, you will learn that China has been absorbing and exchanging ideas with the world for centuries. On the other hand, the world will not be a stable and prosperous place without China. China follows an independent, peaceful foreign policy. It has proclaimed to the world that it will never seek hegemony or expansion. China believes that security should be based on mutual trust, mutual benefit, equality and coordination. China has been a responsible player in international affairs and has played an active part in UN peacekeeping missions. China is committed to resolving regional hotspot issues and meeting global challenges. China pays great attention to the issues, whose solution requires the energy, imagination and creativity of you young people. For example, climate change; nuclear security; a stable global financial system; tackling terrorism and the attainment of the Millennium Development Goals. China follows a win-win and opening-up strategy. A more developed China not only benefits the Chinese people, but also people from other parts of the world. As the leading global exporter, China’s affordable exports have helped improve people’s lives all over the world. China has imported an average of 687 billion US dollars worth of goods annually for the past decade, creating more than 14 million jobs for its trade partners. The Chinese businesses’ going-global efforts have contributed to economic growth, employment and social programmes of host countries. China has attracted a total foreign investment of more than one trillion US dollars. Trade by foreign-funded companies takes up more than half of China’s total trade. That translates into attractive profit margins for international investors. Economic progress in a globalized world depends on international collaboration. So China has been playing an active part in global economic governance and the G20. China’s relationship with the EU is important for both sides. China is the largest developing country while the EU is the largest group of developed countries. 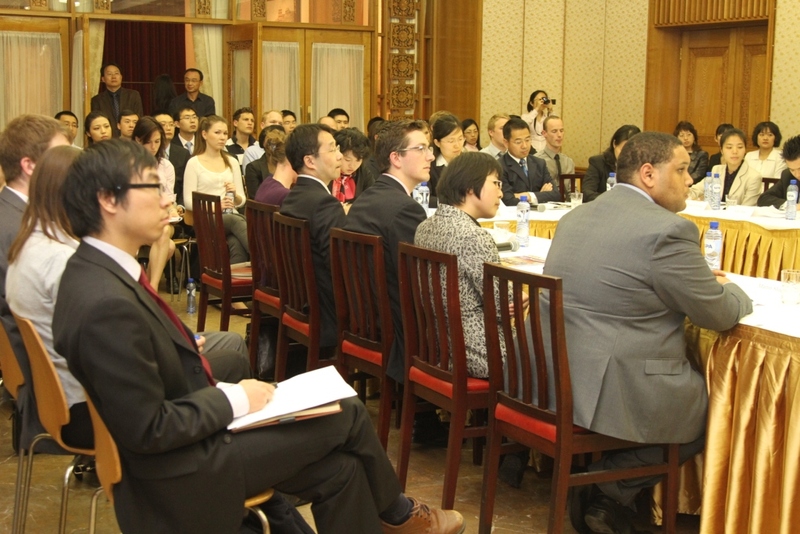 China and the EU share extensive common interests and it is imperative that we cooperate. Over the past 35 years, the China-EU comprehensive strategic partnership has grown from strength to strength. The EU is now China’s largest trade partner and source of technology. China and the EU have in-depth cooperation and exchanges in a wide range of areas such as politics, culture, education, sustainable development and international affairs. As the international political and economic landscape evolves, China-EU relations are faced with both opportunities and challenges. Mutual understanding holds the key to sound relations. World history of the past few centuries is littered with examples where relations between countries broke down through ignorance and lack of tolerance of different cultures. As Herman Melville, the American writer, pointed out, “Ignorance is the parent of fear”. I believe regular dialogue between the young people is what holds the promise of our future relationship. As you interact with fellow young people from different cultures, you get to understand the other’s national differences. You can then grasp different conditions and visions for development. Mutual trust and friendship is therefore nurtured. Secondly, we need to respect each other. Disagreement on certain issues is only natural given our differences in developmental stage, political system, historical and cultural heritage. It is important that we respect each other, seek common ground and shelve differences, instead of imposing one’s will on the other. This is exactly what the famous thinker Confucius meant by, “do not do to others what you would not like others to do to you”. In other words, seek mutual respect. Thirdly, we need to learn from each other. Both the Chinese and the European civilisations have contributed significantly to human development as a whole. Many of the ideas drawn from these two civilisations are still very relevant today. Looking into the future, we in China have the 12th Five-Year Plan, while the EU has the “Europe 2020” strategy. We should draw upon each other’s strengths in development. An advantage young people enjoy is that you are quick to learn. I do hope that young people from China and the EU will cherish every opportunity to learn and to help China and the EU grow and make progress together. Fourthly, we need to be bold and be innovative. Sustained growth of China-EU relations calls for new areas and creative ways of cooperation so that more results will be produced. Young people are never afraid of exploration and innovation. So we count on you and your generation to do something great for China-EU partnership and inject new vitality to it. In this way it is in your hands to create a brilliant future. My hope is that by being here today, you start a journey of exchanges, mutual learning, mutual understanding and friendship. I am confident that you will contribute your share to China-UK relations and the relations between China and Europe in the long run. Please allow me to conclude by quoting Premier Wen Jiabao at the opening ceremony of the China-EU Year of Youth this February.